Glover, Ian, and Zell, Leonard (2010) Great Desert Tracks: atlas & guide. Self-Drive Touring Guide . Hema Maps & Wild Discovery Guides, Australia. 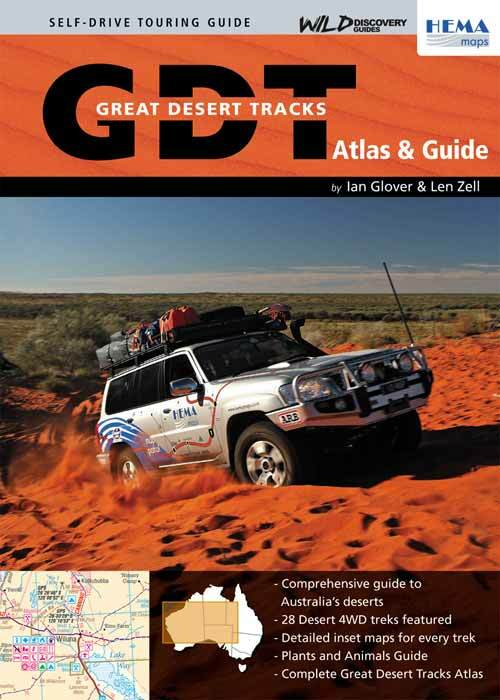 Following on the sell-out success of two print runs of Great Desert Tracks Atlas & Guide, HEMA Maps and Wild Discovery Guides are pleased to announce that a fully updated second edition is now available. 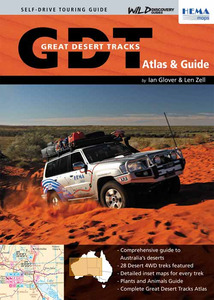 Co-written by highly experienced desert adventurer Ian Glover and desert-loving scientist Len Zell, the new Great Desert Tracks Atlas & Guide features revised copy where appropriate to bring it completely up-to-date, and many new descriptive accompanying photographs. HEMA’s latest maps are also included, giving the buyer the best available mapping for all the desert areas of Australia. For anyone contemplating a trip through any one of Australia's 17 deserts, the new edition is a ‘must-have’: spiral-bound for ease of use, this A4-sized book of 272 pages is lavishly illustrated with photographs, shows a strip map and full information for each of the treks, and is packed with trek and safety information, advice on vehicle preparation, lots of info (and photographs) on the sort of flora and fauna desert travellers will be likely to see, important phone numbers, and the complete set of maps comprising the HEMA Great Desert Tracks Atlas. At $49.95 it’s great value for money. Winner of the Best Book Based Product award and the prestigious Graham Stanton Award for Excellence at the 2007 International Map Trade Association conference and trade show.